Its been years since I got my first taste of an AMG-tweaked Mercedes-Benz sedan and it was a disturbing experience. The C63 AMG rocked me to my core. It left such an impression that even today the roar of the naturally aspirated V8 still rings in my ears. So my first desire on seeing the 2013 E63 AMG is to listen to its engine note; does this car also sound like God wanting to issue a battle cry? Has the shift to force-feeding muted some of the savagery of a naturally aspirated engine? The answer hits me rapidly as I turn the key and poke the throttle with my Gola's. The maker's communication lines are still open! 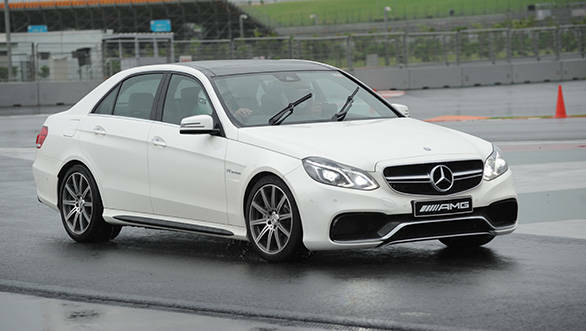 The Mercedes-Benz E63 AMG is Europe's answer to the muscle cars that flourish on the American continent. Big, brutish and brash, the cars that come out of the almost surgically sterile environment of Affalterbach - AMG's headquarters in Germany - are not known to be kind. But then, neither are the tightening emission norms and consumers demands for greater fuel efficiency. It's forced almost every manufacturer to look at cleaner and more efficient engines, small car to supercar: none have been spared. AMG, which was revered for its big-bore V8 and V12 engines is now toeing the line in what is globally becoming the norm  turbocharging. It's not the first time AMG have turbocharged an engine; in fact, the previous generation E63 AMG was the first to employ this bi-turbo engine. What is interesting, however, is that this E63 AMG has come in very quickly incorporating some of the changes seen on the new E-Class. Minor tweaks to the engine see it deliver 557 horsepower with 700Nm of max torque. The twin-turbo plays another big role and that is noticeable when you feel the max power kicking in around 1500rpm earlier than before. It's the same feeling with the torque. So what you get is a wider powerband where the power and torque come in earlier and peak later. But numbers are for accountants. I'm on the Yamuna expressway; its the only place that has straights long enough to see just how quick this car can be. That and the fact that I also have to take this car to the BIC is confining me to this soulless expressway. So I decide to bring down the hammer on this road and whack the throttle open. The boom from the exhausts threaten to erode the concrete layers, the darkies stretch for several meters and in just a fraction more than 4 seconds, the speedo needle swings past 100kmph. The sweet spot is the transmission. The 7-speed dual clutch transmission has a vicious kick, especially if you punch the throttle open from the word go. The transmission bite is similar to what I felt in the Lamborghini Aventador: it snatches every gear viciously and then delivers the torque to the rear wheels in an instant. You simply have no time to realize how the first four gears got spent because the noise, the g-force and the tyres screaming bloody murder are all that's grabbing your attention those first few seconds. There is no dearth of pace in this car, and it feels absolutely mental delivering that turn of speed. Unfortunately, the E63 is limited to 250kmph and that mark comes up so rapidly you are left feeling a bit shortchanged. The surge of power all the way to 250kmph is relentless and unrestricted, this car could easily see 300. In fact, an optional performance package will bump the top speed to nearly 300kmph. Mercedes haven't released the list of options yet, but it should be up in their website shortly. The AMGs were very popular - like the American muscle cars - for their straight-line performance. When it came to a racetrack with its lefts and rights, chicanes, reducing radii and off-camber corners, the AMGs felt a bit lost. Turns out over the last couple of years, AMG has been working on improving the dynamics of their cars. One of the best examples was the SLS AMG, but that was a supercar and it had to be complete in every respect. It's only of late that the same sense of pinpoint accuracy and stability has been filtering down to the other cars that wear the AMG badge. The first time I drove the C63 AMG at the Nurburgring it was a beast, untamable and wild and only the ones who knew to exercise precise control over their actions on throttle, brake and transmission could derive the best out of that car. Me, I was all over the place; I even got passed by a VW Golf. Let me tell you, it's not easy finding the right mix in a car with a truckload of power and rear wheel drive on a track that at its widest has just enough space for two E-Class sedans standing head to head. And so, I find myself climbing up towards C2 on the BIC, the left hand gradient is one of the trickiest turns of the BIC because it hides a hairpin right at its crest leading into the long back straight. Nail this right and you can probably hit 250 down the main straight. Fortunately, the track is dry and there is loads of grip available. The tricky part is getting the braking point right after which you have to follow it up with the right turn in point, exit and floor the throttle. Most supercars get past 270 but they also do it on the might of their power-to-weight ratio. The E63 AMG may be powerful enough to give it an edge, but this is still a very heavy sedan and a lot of that weight is poised over the front axle. It gives it a understeery feel in the sharper corners but I also find myself warming up to a character I never expected. The E63 AMG can dance! The steering is precise and has a fantastic feel to it. It's not ponderous and turn-in is quick. The suspension has been beefed up considerably, to the point where on the roads it feels hard but not harsh. On the track, it provides a very direct and agile stance. Yes, you can feel the weight shift in this car, but its not intimidating any longer. It's also quite easy to break traction given the rear wheel drive nature, but thanks to the improved steering, it's also simple to get it back under control with little effort and bile ejecting. I think the E63 AMG now has bit of a duality in its character. It's still rude, it's still mean and brash and loud and aggressive, but there is a faint hint of maturity. It knows when to clam up and go about doing its job. This is still a sedan, and despite AMG taking the base E-Class and twisting it around into a hyper saloon, it is still a four-seater saloon. It's comfortable, luxurious, spacious and offers everything a standard E-Class sedan has to offer. 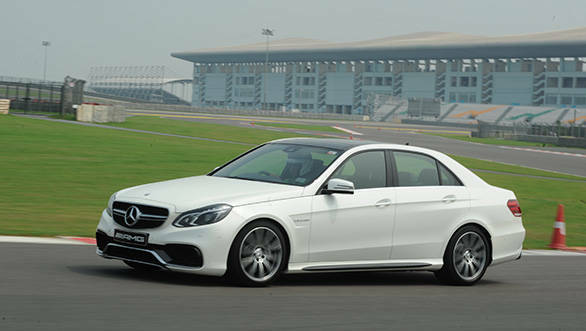 But it's also twice the price of the standard E-Class at 1.29Cr. But if you're the kind that sprays extra formula in your locks, haven't given up your leather jacket, still have pierced ears and a rude boy tattoo, this is the car for you. And I should probably tell you about the styling and the detail changes that AMG bring to the table. The base platform is the new E-Class, so the silhouette hasn't changed. What is new is the grille, bumpers at both ends, special light-weight alloys and beefy fenders. Quad exhaust at the rear complete the changes. Inside, it's a mix of the new E-Class and what AMG have drawn up. Carbon fibre elements in the dashboard, drilled pedals and a new transmission control selector on the console. My attention, however, sprang to the seats which look cool, offer both heating and cooling functions but have one absolutely wicked function: the dynamic lumbar support system which bolsters either the right or left seat wing depending in the side the steering wheel is turned. So a right turn prompts the system to bolster the left wing since that's the side you physically get pushed and the other way round when you swing the wheel the other way. Oh yes and I must mention efficiency and low emissions somewhere: the Mercedes-Benz E63 has start stop!